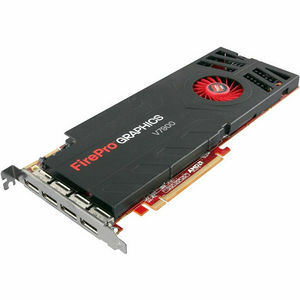 AMD FirePro™ V7900 professional graphics cards deliver incredible performance, superb visual quality, and outstanding multi-display design experiences --all from a single-slot solution. It is an excellent solution for professionals who work with advanced visualization, complex models, and large data sets. The AMD FirePro V7900 features incredible multi-display capability with AMD Eyefinity technology support for four simultaneous and independent monitors from a single graphics card.1 Also, the AMD FirePro V7900 is backed by 2GB of ultra-fast GDDR5 memory and 1280 stream processors.